South Central Expansion. Photo provided by Valley Metro. The South Central Light Rail Extension, which will add 5.5 miles to the current 26-mile Valley Metro Rail System in Metro Phoenix, will move forward following months of discussion over the design. A map of the route used at the public meetings. Click image to enlarge. On June 20, 2018, the Phoenix City Council requested that Valley Metro analyze an alternative that maintains four vehicle lanes on the South Central Extension to the fullest extent possible within the federally-approved environmental footprint. The council also asked that a comprehensive business and community engagement process be conducted, facilitated by an independent facilitator, to specifically discuss the full impacts, costs and benefits of the four-lane design. The council direction came after community members expressed concerns over the approved two-lane design. The two-lane design reduces the number of lanes from two in each direction to one in a section of the alignment. Community concerns ranged from traffic flow to possible business impacts. Some also shared that they weren’t aware of the early public meetings to discuss the design and felt the community outreach should have been more extensive. The extension was approved by voters in 2000, 2004 and in 2015; 75 percent of those who live along the line voted in favor of Prop 104, Transportation 2050, which provides the local funding for the extension. 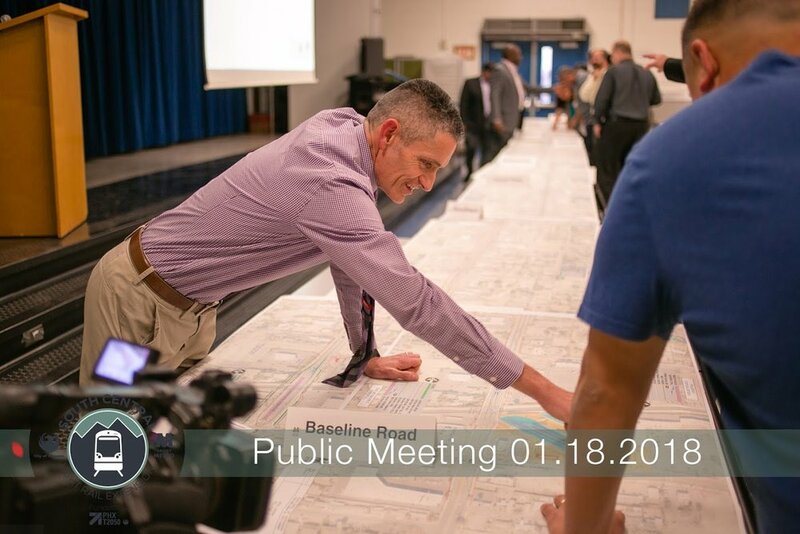 With direction from voters, the Phoenix City Council approved the extension route and roadway design in 2014 and acceleration of the project in 2016. One of the boards used at the public meeting. Click to enlarge. Why the two-lane roadway design? The two-lane design achieves the community’s desire for a pedestrian-friendly environment that includes sidewalks, shade, and dedicated bike lanes, while also limiting property takes. The two-lane design also saves nearly 80 businesses that would have otherwise been wholly or partially torn down to fit four lanes of automobile traffic and the trackway. These kinds of property impacts would dramatically alter the character of south Central Avenue. 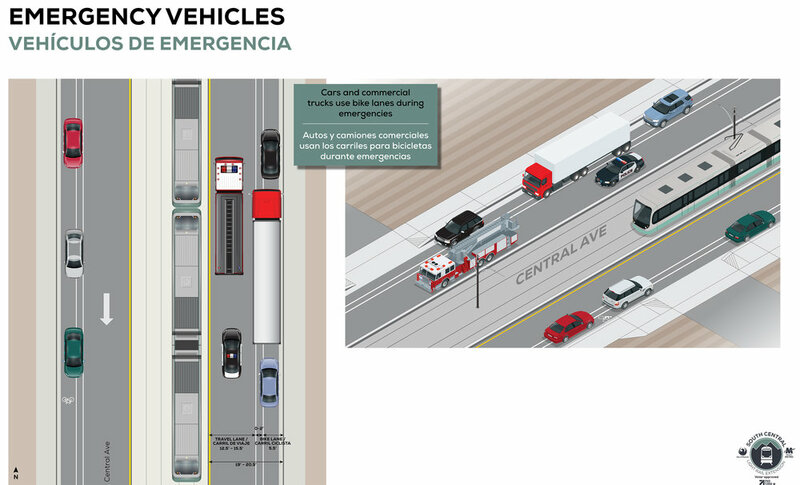 The two-lane design includes bus pullouts to keep vehicles moving when buses are stopped and allows for emergency vehicle access. This design improves public safety in this corridor by providing emergency vehicles with easier access to travel along Central Avenue. The two-lane design was reviewed and approved by Phoenix Fire and is safer for all than a four-lane configuration. One of the boards used at the public meeting. With council directive, Valley Metro staff and consultants completed an analysis of a four-lane configuration and presented the findings through video simulations and graphical display boards at a series of six public meetings moderated by an independent facilitator, Eric Bailey, Bailey Strategic Innovation Group President. Open House. Photo provided by Valley Metro. Public Meeting. Photo provided by Valley Metro. Due to the stage of the project, the lane decision had a significant impact on how the South Central Extension moved forward. FTA guidelines required that, in order to move forward toward a grant, a project must transition from Project Development into the Engineering Phase. This project’s deadline to move into Engineering was November 2018. Any delay taking the project past this deadline would greatly increase the risk of losing federal funding. On September 26, 2018, the Phoenix City Council voted 6-2 to continue to move forward with the existing two-lane design for the South Central Light Rail Extension. Phoenix Mayor Thelda Williams said the South Central project would connect neighborhoods to opportunity and spur economic development in the area. One of the boards used at the public meetings. Click to enlarge. A petition was filed in November 2018, in an effort to stop future light rail projects in the city of Phoenix. The initiative seeks to amend the city charter to terminate “the furtherance of any light rail extension or any other fixed rail line transit system” in Phoenix. It also seeks to “redirect the funds” to finance infrastructure improvements in South Phoenix and throughout the city. This initiative is specific to the City of Phoenix; it does not currently affect light rail development in other cities. However, it could have repercussions on the future of transportation funding in this region. The initiative seeks to re-direct Proposition 104 (Transportation 2050) funds for light rail extensions to finance other infrastructure improvements within South Phoenix and the city. Other regional and federal dollars dedicated to rail transit would be unavailable to the city for other uses. Proposition 104 funds only 15 – 20 percent of the total costs of building Phoenix light rail extensions. The majority of funding comes from federal grant programs and regional Proposition 400 dollars that are dedicated exclusively to rail extensions and cannot be transferred to other uses or city projects. The city could potentially lose upwards of $5 billion in federal and regional monies to other cities in this region and across the U.S. who have rail projects moving forward. The Phoenix City Clerk verified that the initiative contains a sufficient number of valid signatures on January 1, and the Phoenix City Council voted on February 6 to refer the initiative to the August 27 ballot. There is a legal challenge focused on election law concerns from the Arizona Chapter Associated General Contractors. 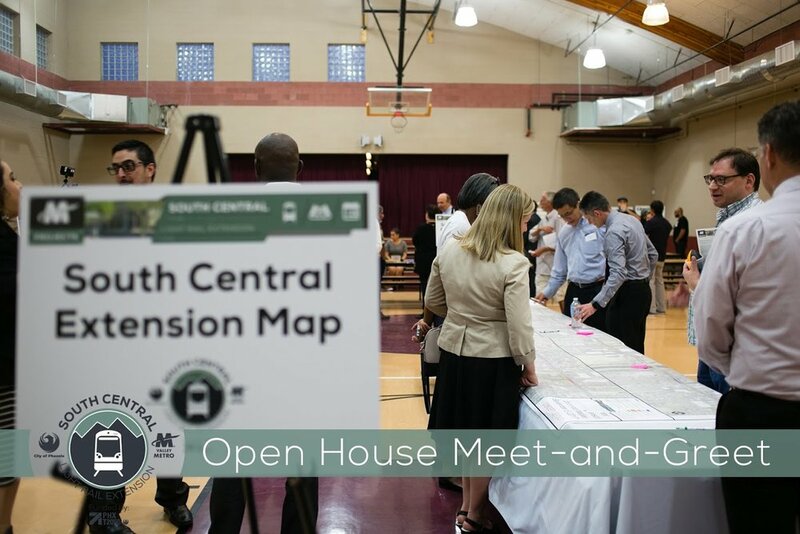 As the city works through its process, the South Central Extension continues to advance. Valley Metro will continue with design and early utility work consistent with the existing policy, which was established by previous voter-approved measures and multiple Phoenix City Council actions. Continued work is also critical to keeping projects in the Federal Transit Administration (FTA) funding pipeline. More than $3.5 billion in FTA grant dollars, dedicated to fixed guideway/rail projects, is anticipated to support the Phoenix rail capital program. A stop or pause in these projects could cause the city to lose this significant federal investment to other communities nationwide. Related to the South Central Extension, utility work in downtown Phoenix is necessary in 2019 to meet the Phoenix hosting requirements of the Super Bowl in 2023. Light rail is part of system of services that connects people to education, employment and entertainment; and this project seeks to better connect South Phoenix and its offerings to the rest of the Valley. The South Central Extension is scheduled to open in 2023. Valley Metro is the regional public transportation agency providing coordinated transit services to residents of metro Phoenix. From regional bus, light rail and paratransit service to alternative commuter solutions, Valley Metro’s core mission is to develop and operate a network of transit services. In 1993, Valley Metro, along with local governments, began funding a regional transit system that now covers 513 square miles. Today, member agencies include Avondale, Buckeye, Chandler, El Mirage, Fountain Hills, Gilbert, Glendale, Goodyear, Maricopa County, Mesa, Peoria, Phoenix, Scottsdale, Surprise, Tempe, Tolleson, Wickenburg and Youngtown. The Valley Metro RPTA Board of Directors set policy for bus and paratransit services. Learn more at https://www.valleymetro.org. Joshua Matthews, AICP, serves as Planner III for Valley Metro. Matthews has worked in urban planning for the organization since 2013. He has a Bachelor's and Master's Degrees within the field of Urban Planning at Arizona State University.